While Pokémon Go is definitely the primary benefactor of its own success, that doesn’t mean it’s hurting its competition in the mobile gaming space. New data from mobile commerce provider DOCOMO Digital has found that in fact, the Google Play Store’s top four grossing apps have seen a 10 percent increase in overall revenue from their games in Europe since the debut of Pokémon Go. 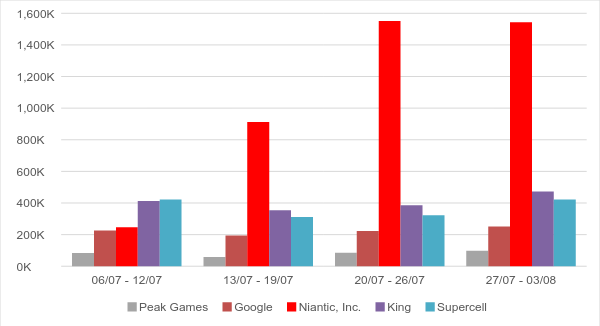 Niantic claims the crown of highest earner, of course, and initially did cause a bit of a dip in spend among the completion. But spending quickly returned to pre-Pokémon levels – and then leapt ahead, rising higher than they had been before the game’s launch. The Niantic competitors DOCOMO Digital looked at for the snapshot included King, the firm behind Candy Crush, and Supercell, as well as Peak Games and Google. Across the board, developers saw lift, and the takeaway is that games like Pokémon Go which convince users to spend results in a net positive effect on user attitude towards spending in general. In other words, once people starting buying Pokéballs, they were far more comfortable with the idea of buying digital goods in general. What’s bizarre, though, is that DOCOMO Digital didn’t see the same effect when they looked back at the launch of other big in-app purchase games, like Clash Royale and Candy Crush Saga. The games themselves enjoyed spending spikes, in those cases, but others did not. The firm attributes Pokémon Go’s unique effect in this regard to how big it got so quickly, which resulted in a much bigger door opening effect for users enabling direct carrier billing. Once it was enabled for a large group of uses new to the payment method, many of those started employing it elsewhere, too.